Renata Wolfman likes only facts, to wear every day the same kind of clothes, and above all to spend time by herself. This is why she is called Wolfie at school. She doesn't have friends, and she does not understand why she would want to have one. Having friends requires "cooperation", "compromise", and "respecting other people's opinions", and Renata is perfectly fine with her own opinions. One afternoon, while building a huge submarine with a fridge box, Renata hears a desperate knock in the door, and when she opens it Livingston Flott is there, asking to go inside right away, since he is running away from his brother. Livingston is not only her neighbor. He also attends the same school as Renata, where he is called Fly for annoying people buzzing. Renata expects Livinsgton to leave quickly, but when he sees her submarine, there is no way to make him go. Renata is not sure how but a few moments later they are both inside the submarine, packed with food supplies, traveling underwater. And to Renata's surprise... she is actually enjoying it! Splendid beginning for a series! Renata is so lovable in her own way, and Livingston is such a cute character. The text is uncomplicated and full of humor. I loved all the imaginations involved in their adventure. The illustrations are a great complement to the story. 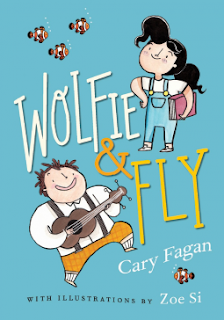 I am already looking forward to more Wolfie and Fly's adventures. Kids love to pretend they are animals, and roar, walk on four legs, or move they arms like flying. For this reason I find the idea of this book incredibly interesting. Animals sometimes "act like kids", since they also dance, play tag or leapfrog, have piggyback rides. For each of these examples there is an explanation for this behavior. Grey Tree Frogs, for example, blow bubbles to build a nest on trees above water where they lay their eggs, allowing the tadpole to fall into the water when they hatch. 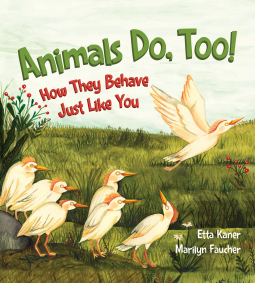 The illustrations are colorful and bright, and help to compare kids and animals doing the same activity. I liked that the kids are shown in different spaces, like a park, beach or their home, and accompanied by their family and friends. Each animal is also portrayed in its environment and surrounded by their own. Beautiful picture book. 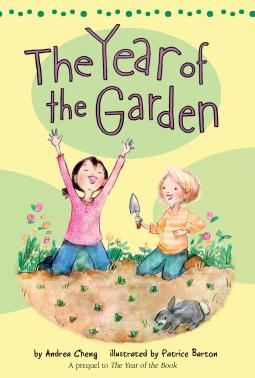 The year of the garden is a prequel to The year of the book and the Anna Wang Series. In this novel Anna meets Laura who, like her, has just moved into the neighborhood. They like each other right away, but sometimes it is not that easy to be friends. Even being the same age and prospect of attending the same school at the end of the summer is not always enough. They like to do different things, and have different personalities. Sometimes the different cultural background plays its part too. But they learn to focus in what they have in common, and the importance to know more about each other to better understand their interests, fears and dreams. Making a garden and saving a little bunny prove to be amazing plans to do together. This short novel was a pleasure to read. The story is sweet, with lovely characters. It not only is funny, but it has simple facts about seeds, flowers, soil, bunnies, Chinese food and festivities, soccer, and specially friendship, and how some difficulties don't mean it is impossible. Friendship is something we build while growing in the process. And it's worth it. There are many cute illustrations along the pages, which make the layout of the book beautiful. Looking forward to read the rest of the series! Harry and Clare are staying home this spring break, and to make things worse the weather is not helping. They don't seem to care, though. They do an expedition to Mars, and also a cars race. They play pirates, and school, and circus, and jungle. Everything would be perfect if Clare wasn't the only one making the rules, and, what it is worse, if she wouldn't manage to always eat both their snacks... Harry has a plan, and when he gets to hoard some supplies of "asteroid burgers" and "volcano sticks" in this pockets, things start to change. The story made me laugh out loud. Harry and Clare are very funny, and it is impossible not to relate with their little conflicts. At the same time they manage to solve them in a friendly way. These siblings are so imaginative and creative, and the illustrations accompany so perfectly their games. Sam's bedroom is a complete mess. It is time to clean it up. Sam begins to sort all his stuff to put it away, and he discovers there are so many ways of sorting things! Like in many other sorting books Sam sorts by shape, color, type and function. 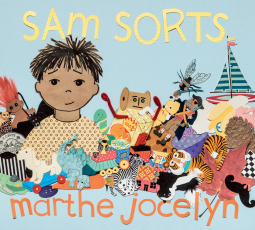 But what I loved about this book is that Sam dares to go beyond and he sorts his stuff in original and creative ways: things that come in pairs, things whose names rhyme, things with dots, holes, stripes or checks, soft, bumpy, fuzzy, noisy, pointy, smelly. No, that's not all. There are thing that float, and things that fly. Wait. Actually there are things that fly with wings, and things that fly without wings. Even things with wings that do not fly! The outcome is that Sam's stuff is still in a pile, but he has learned a lot of things, and had a lot of fun. The pictures are wonderful. The complete book is a huge collage in different colors and textures. The author uses Venn diagrams in such a natural way as part of the story, no explanation is needed. But not all the objects are sorted using Venn diagrams, some times different color backgrounds, or even a rainbow or a pac-man "screen" do the trick. I was happily surprised by this book. A decided 5 stars. Miles McHale is a great boy. 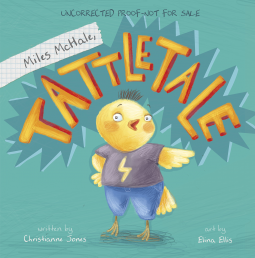 He is funny, and smart, but he has a big problem, he is a tattletale. He tattled all day long, and even during night. At school he wasn't the only tattletale, but he was definitively the worst. So one day Mrs. Snitcher decides to start the Tattletale Battle, whith the pledge "If a friend is sick, hurt, on in harm's way, then telling someone is OK". The team with fewest number of tattles at the end of the week gets extra recess. Miles is not doing really well. He is trying hard, but sometimes it is difficult to know if he was tattling or not. By the end of the week his team is loosing, and his friends don't want to talk to him. Then is when he decides it. No more tattling. Ever. Poor Miles had to learn the difference between tattling and telling the hard way. The story shows in funny and exaggerated examples why tattling is so annoying and also useless. At the same time, deciding to never tell anything again is wrong. Sometimes someone might need our help, and it is necessary to tell an adult what is going on. It can be difficult in some occasions to know if that would be tattling or telling, but as any other social skill, it can be learned and improved. I immediately fell in love with the colorful illustrations, that look fluffy and so expressive. 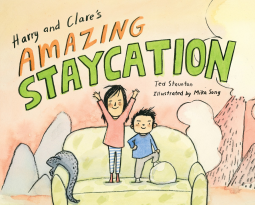 I would say this is a wonderful picture book who focuses in enhance social health in kids, something important to better fit in a community, and enjoy the social experience. What a wonderful Christmas Story! "When Santa’s workshop is destroyed by a ferocious storm, even the richest man in the world is stumped for a way to save Christmas. 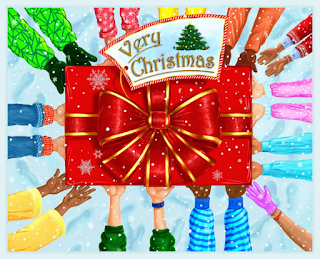 Just when everyone seems to give up all hope, the unstumpable Ava Buttons, together with her friends, discover a way to make Christmas wishes come true. Motivated by a desire to help others, Ava converts even her naughtiest friend, Rowdy Meyers, from an enthusiastic getter to a champion giver." It is a fact. Santa workshop is destroyed, all the presents are lost, and all the "Dear Santa" letters returned to the senders. Not even the richest man in the city with all his money can fix this. Christmas is not coming this year. Ava and her friends are incredibly sad. There must be something they can do to save Christmas. But what? Reading the returned letters, Ava realized that she can fulfill one of the wishes giving one of her toys. What if each of them do the same? Would they be able to fulfill all the wishes? They can at least try. The outcome is exceptional. The pile of presents is huge, but more important the good feeling of give to other is gigantic. So gigantic it also reaches Rowdy, the most self-interested kid at school. Focused in how it is more important and comforting to give than receive, this story is funny and heartwarming. It left you smiling and hopeful. It is also funny, with lovely characters, and an interesting layout. All of this without giving away Santa's identity secret. As you can see the cover is beautiful. This is not exactly a picture book, but more of a short story. Although there are some small illustration, these are particularly details, not full page pictures. I decide to label it for kids 5 years old and up thinking in the amount of text, and specially the amount of time it needs to be read, that probably it is too much for a toddler. Great story! Give it a try. I received this copy from the author through NetGalley in exchange for an honest review.